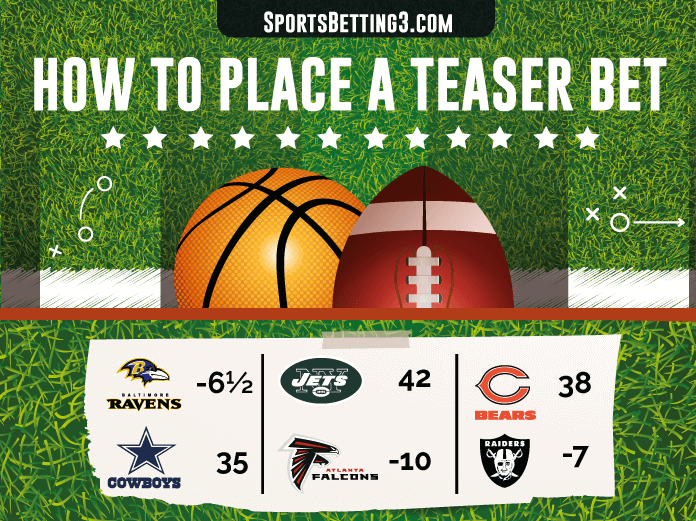 Teaser Betting Ultimate Guide - What is a Teaser Bet? Bet Smart or Lose! Complete teaser betting overview. Not all NFL Teaser Bets are created equal! Some NBA teaser bets are for chumps. Learn which teaser is better: Standard vs Sweetheart. See why this bet isn’t always profitable in the long run. Combine multiple spread and total bets into a modified parlay. Buy points to shift lines in exchange for a smaller payout. Select 2-10 spread bets, total bets or combinations of both. Buy points to shift lines in your favor. Favorites can now win by fewer points. Underdogs can now lose by more points. Under now more likely with higher total. Over now more likely with lower total. Sportsbook tie bet rules vary. Read below. Popular Exotic Bet. NFL and NBA teasers most common. NFL bettors buy 6-10 points. NBA bettors buy 4-5 points. ½ point increments possible. Points apply to both spreads and totals. Spreads shift lines to bettor’s favor. Choose underdog or favorite, over or under. Prohibited: Money lines, futures, props, betting both sides of line and betting same team twice. Bettor make 3 selections: Ravens -6 ½, Jets vs Falcons Under 42, Bears +7. Bettor selects 6.5 point teaser. Each line shifts 6.5 points in bettor’s favor. Lines are now Ravens 0 pk, Jets vs Falcons Under 48 ½, Bears +13.5. Bet pays +135 odds if successful. Individual spread and total bet selections win, lose or tie according to game outcome. Teaser wins if all selections win. It also wins if sportsbook grades ties as wins. Teaser loses if any selections lose. It also loses if sportsbook grades ties as losses. Review sportsbook teaser rules. Selection size, points purchased, and other factors determine how ties affect your teaser. Each tie usually reduces payout by 1 selection above 2 selections. Some sportsbooks rule ties as wins. Others rule ties as losses. For 3+ Selections: Each tie reduces payout by 1 selection. From above example, a Ravens tie would reduce teaser to 2 selections. Multiple ties continue reducing until at least 2 selections remain. 4 selection teaser with 2 ties would become a 2 selection teaser. For 2 Selections: Ties do not reduce. One win and one tie results in a refund (no action). One tie and one loss results in a loss. Sportsbooks would lose money paying ties while allowing players to buy 10+ points. A 3 selection 10 pt “Sweetheart Teaser” will lose if any selection ties. But a 3 selection 6 pt basic teaser may reduce to 2 selections rule depending. Less risky parlay alternative. Taking points in exchange for smaller payout manages risk. Good for betting multiple games with a smaller bankroll. Can be profitable if 2-3 NFL spreads teased towards key numbers. See Wong Teaser (Less common). Winning teaser pays less than equivalent parlay. Don’t buy points if your parlay is a likely winner. Tie rules may decrease overall value for some teasers. Separate side and total straight bets are more profitable in long run than combining the same bets into a teaser. 4+ selection odds do not favor bettor in long term. Occasional big wins will be diminished by consistent losses. Sweetheart or Monster teasers are not good value bets. Expect to lose money. Review your sportsbook’s teaser rules. Know how ties affect your bet. Shop sportsbook teaser odds and tie rules. Some charge higher juice but offer favorable tie rules. Others charge lower juice but grade ties as losses. Some sportsbooks charge extra juice for NFL 2-4 team teasers crossing 3 and 7 point margins of victory. This limits their risk to Wong Teasers or “basic strategy teasers”. Don’t bet Sweetheart teasers when standard teasers present better value. You will waste money buying unnecessary points and get a lower payout. Classic Wong Teaser. Select 2 NFL games with totals under 50 ½ and no road favorite. Tease lines 6.5 pts across key numbers 3 and 7. Also called “Basic Strategy Teaser”. Wong Alternate. Select 3 teams buying 6 pts at +180 odds. Try GtBets. Sweetheart Teaser. Tease 3-10 NFL selections 10 or 13 pts. Tease 3-10 NBA selections 7-13 pts. Smaller 3-4 sweetheart NFL, NBA teasers limited to 10 pts, 7 pts respectively. Any tie is a loss. Review Sweetheart Odds tables carefully before betting. According to Robert L. Carneiro’s book Diary of a Football Handicapper, “Jimmy the Greek” said the teaser bet was likely created by Prof. Charles McNeil. McNeil is also credited with popularizing point spread betting in Chicago during the early 1940s. He had been a successful sports bettor for years, starting his own operation only after another bookie began limiting his action. His ingenuity is responsible for one of the most important sports gambling concepts in history. Pleaser – Giving points back to sportsbook in exhange for better odds. Crosses over both three and seven points. Lands on three or seven points, while crossing over the other. Comes off of three or seven points, while crossing over the other. No special teasers accepted during NFL preseason. Any Push or tie results in a loss.